I've been following other people's blogs for years...artists, writers, and other interesting people. Why would anyone want to see my art or read what I have to say? Perhaps there won't be too many of you reading this. But lately, I've had a need to share. Share my creative process or my thoughts. The picture you see above is a piece I did on canvas. The inspiration came from one of my sister's friends and now sits in my living room. The poem I wrote came from one of those fill in the blank poems I saw on Facebook. But it reveals much about me. So what will you see in the future? I'll be sharing my art journal as well as other types of journals I have. Most of my art pieces are inspired by a quote I find. I hope you'll enjoy this journey with me. Thank you Anna. I think this is going to be a fun adventure! I will be keeping an eye on your art. Everything I have seen from you has been both interesting and beautiful, so I look forward to seeing what you present. I truly appreciate your constant support. Thank you, Mia! Bravo! waiting for the next installment! 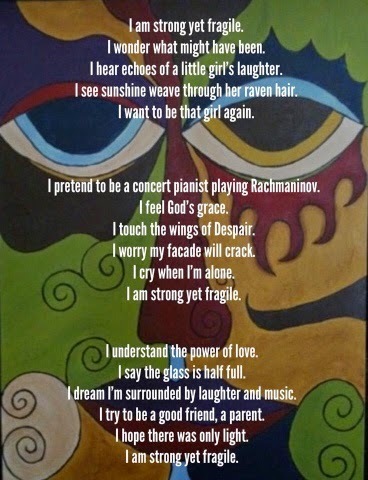 This is a new entry of yours, the graphic is very bold and the poem very deep they strike an interesting balance.